Of these three, the Apple-supported method is to use the security command line tool so I will be focusing on that approach. The rules will be displayed in property list format. Note: When a security authorizationdb action is successful, it will display a YES status message. If the action is unsuccessful, a NO status message is displayed. The first security authorizationdb write command for system.preferences gives all users access to System Preferences itself, which is needed before granting allow rights to other system.preferences.referenced_settings_here rules. Once the commands above have been run, Startup Disk should now allow modification by all users on the Mac. However, the best way I’ve found to edit authorization rights is to leverage security authorizationdb‘s ability to export referenced rights to a property list file and import rules from a property list file. This allows granular changes to authorization rules while making sure that the rest of the rule isn’t changed. 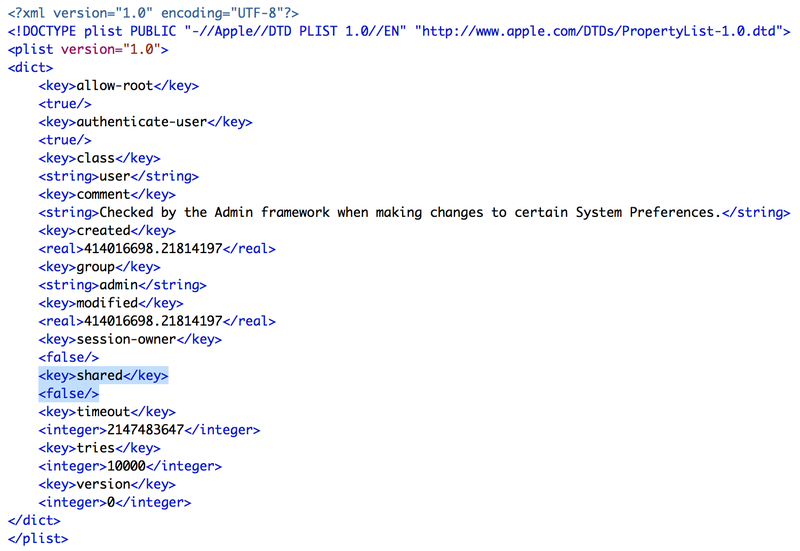 The first command exports the current system.preferences rules as a property list to /tmp/system.preferences.plist. 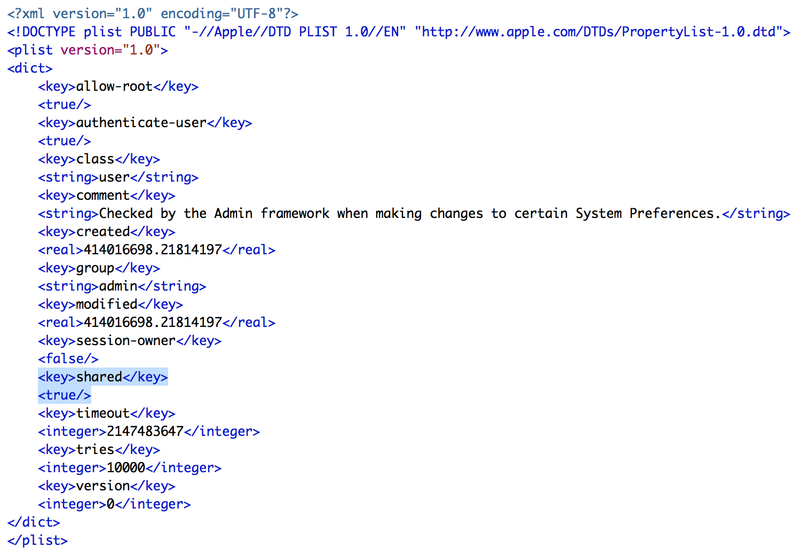 The second command uses defaults to change the existing shared key in /tmp/system.preferences.plist to a boolean value of true. The third command is run with root privileges, reads the contents of the property list file into the authorization database and then updates the system.preferences rules to use the new value. The result is that the Require an administrator password to access system-wide preferences checkbox is now unchecked. The second command uses PlistBuddy to change the existing shared key in /tmp/system.preferences.plist to a boolean value of false. The third command is run with root privileges, reads the contents of the property list into the authorization database and updates the system.preferences rules to use the new value. 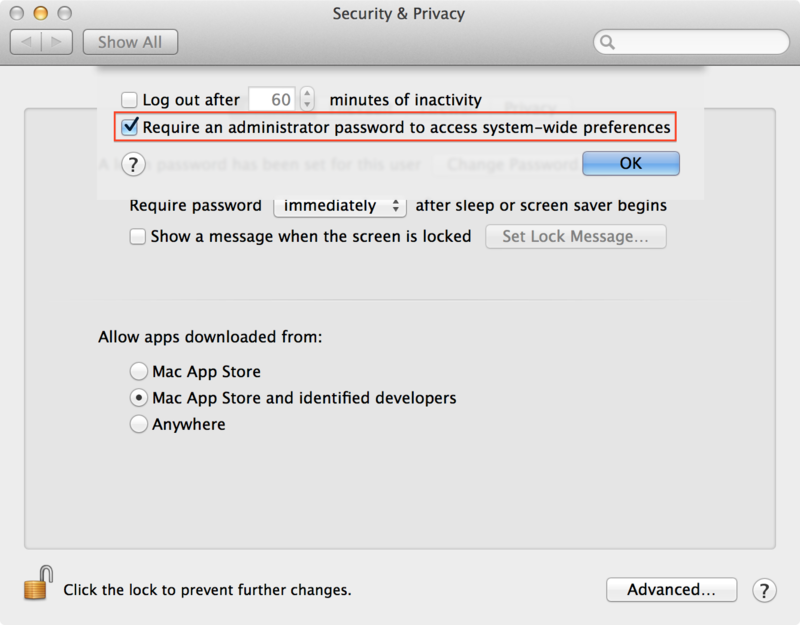 The result is that the Require an administrator password to access system-wide preferences checkbox is now checked. Use security authorizationdb read referenced.rights > /path/to/referenced.rights.plist to export a property list file containing the rule. Modify /path/to/referenced.rights.plist using the property list editor that works best for your needs. Use security authorizationdb write referenced.rights < /path/to/referenced.rights.plist to write the needed changes back to the database. 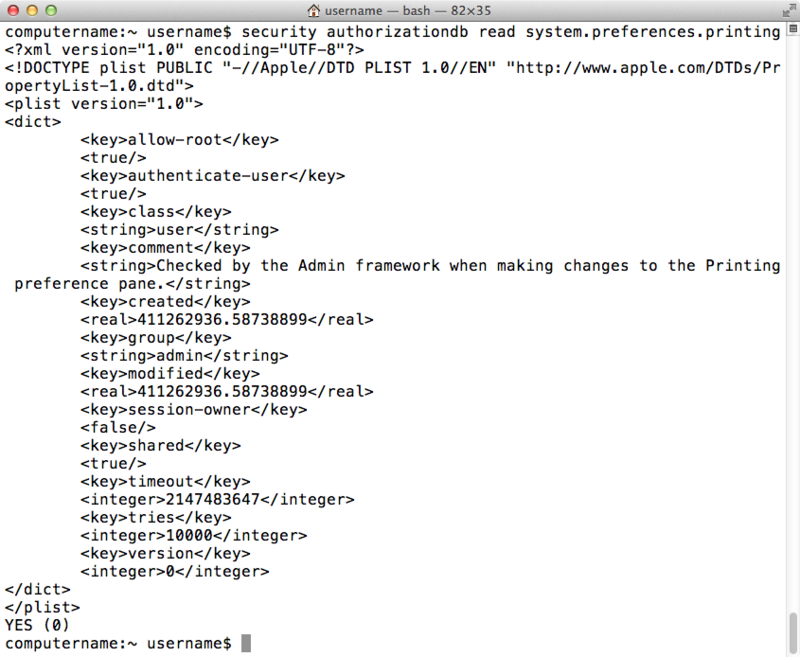 That said, Mavericks offers a way to reset the authorization rules that was not available on previous versions of OS X. In the event that problems occur, it is possible to boot the machine to the Mac’s recovery partition and use the command line to remove the auth.db database files that reside in /var/db/ on the Mac’s boot drive. At next reboot, the OS will detect that /var/db/auth.db does not exist and create a new /var/db/auth.db, using /System/Library/Security/authorization.plist as a template. As always, change is hard, especially when the changes aren’t well documented by Apple. However, using Apple’s security authorizationdb command to edit the database should help Mac admins in the long run by reducing the possibility of problems due to incorrect formatting or other errors. security authorizationdb‘s ability to both export and import property list files containing rule information also helps Mac admins by allowing granular changes to be made to individual rules without worrying about adversely affecting the other rules’ ability to manage the Mac. In my opinion, this change by Apple provides short-term pain and long-term gain to Mac admins by making it easier to manage authorization rules both in Mavericks and in future versions of OS X. Might be worth pointing out that using the `security` command to alter the authorization database also works for older versions of OS X. In other words, we should have been doing it this way all along! Isn’t this stuff supposed to get more simple? Stuff just keeps getting harder and more of a pain to use! Once you setup to allow standard users to run Time Machine backups. How do you also let them encrypt the backup? You still get asked for an admin user and password. Agree with cashxx. Upgrading to Mavericks broke the authorisation for my Creative Cloud – and I made the mistake of contacting Adobe – which allows all manner of people who dont’ understand what’s going on in your computer, remote access. no fix, but lots of extra config. glitches… Apple might point out potential snafus when upgrading e.g. Adobe… its not like Adobe is insiginificant 3rd party software. Anyway thanks for the path through – tangled though it is. this is a very good blog!!! Finally a blog that takes care on MAC OS X and business issues. Thanks for that. This one here is very explaining the new authorization funcionality in Maveric. Do you have any further information how to configure this when using usb smartcards (e.g eToken) using 2-Factor authentication during login? Would be very interesting. Thank you so much for your Tutorial, it was very helpful!! What I do not understand is why i can’t change anything in the authenticate-admin, the authenticate-admin-30 or the authenticate-session-owner-or-admin rule. Anyone has an idea? The first two lines work ok but it won't write it back into the auth DB. The same command even won't work if i leave away the second line and change nothing in the plist file. Does anyone has tips or ideas how to resolve this? or inputs why it doesn't work? Great information. Is this still current for Yosemite? Jonathan: Yes – I have been using this sort of workflow as of 10.10.4 / 10.10.5 deployments. And maybe, include options for frequent managed items to simplify management. Do you think this community would be interested in this type of script? Or can you get all the functionality needed using the “security” command? Is this still working on 10.12/10.13 ? I managed to add a new ‘group’ for example on my plist but when I want to write the change back, it looks like it’s not being applied.